This 10,000 scale 3D model of Montale a small ancient village near Pistoia in Italy, was completed in year 2007 during a workshop focusing on active citizenships, urban exploration and transformation. The blank model was manufactured by the children. 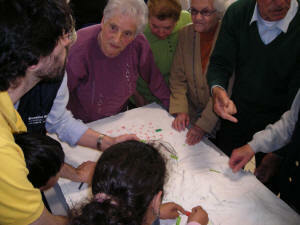 Thereafter they visualized data shared by adults (mainly elderly people) through a process of intergenerational knowledge exchange. 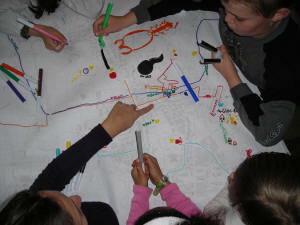 The children were than guided in reflecting about the past, present and possible future of their bio-cultural region. The exercise has been facilitated by Andrea Giraldi. PhD student of the Università degli Studi di Firenze Facoltà di Architettura Dipartimento di Urbanistica e Pianificazione del Territorio. 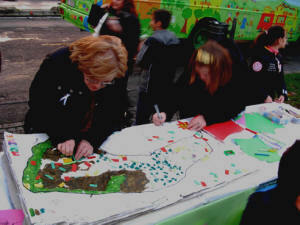 This process generated a collective map featuring the places relevant to children. The process allowed exploring these sites and focusing on a place along a small river which is abandoned and in bad condition. Children planned how to reclaim and restore the riverbanks, cleaning it from rubbish and and planting a little garden with the help of neighbours. 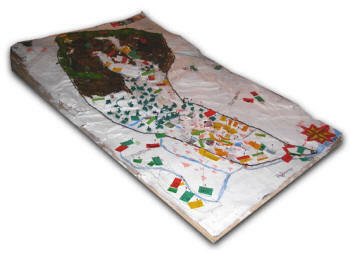 The model features the administrative boundaries of Montale. It includes a mountainous zone covered by forests that gradually leaves the place to small villages on the hills between olives trees and vines. The town on the valley floor is where service facilities, new houses and industrial zones are concentrated. Most children spend most of their their free-time in-house and have few moments of direct and autonomous experience of the outdoor, especially in the urban environment. The model offered a holistic vision of their landscape, with a story in evolution, and it raised their awareness on the opportunity for experiencing and transforming their own place of living.